(CNN) -- Argentina's Daniel Vancsik returned to the course at nearly 8pm and bogeyed two of the last three holes to throw the BMW Italian Open in Turin wide open again. Argentine Vancsik was among seven players who had to quit the course because of the danger of lightning. Vancsik, chasing his second European Tour victory, had been two in front when a thunderstorm halted play at 4.10pm. 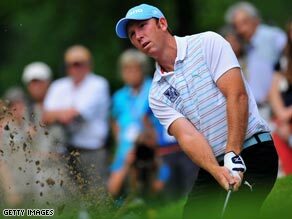 But when play resumed he failed to get up and down from a bunker at the 16th and three-putted the 17th. He was in severe danger of dropping another stroke at the last after pulling his drive into thick rough, but got down in a pitch-and-pitch for par. As a result the 32-year-old, winner of the 2007 Madeira Island Open, goes into the final round 11 under par, one in front of Finland's Roope Kakko. The pair ranked 420th and 472nd in the world scored 69 and 68 respectively, little-known Challenge Tour player Kakko also bogeying the 17th on the resumption. Two behind in joint third are Northern Ireland's Gareth Maybin and South African Thomas Aiken, Maybin making a remarkable birdie on the 17th after double-bogeying the 16th. From the left-hand rough the Belfast golfer's approach with a fairway wood skipped the bunker in front of the green and rolled up to 15 feet, from where he sank the putt. Vancsik commented: "I was really unlucky with the timing of the break. I was feeling very confident, but lost concentration when we went back. "I'm still happy to be leading and confident about tomorrow." American John Daly returned a third successive 69 and at six under is in a tie for 11th in the second event of his comeback after four months out. The former Open champion was given a six-month US Tour ban in November after being put in jail to sober up and has come down from 20 to 16 stones since undergoing lap-band stomach surgery three months ago. Daly was 31st in Spain last week and is staying in Europe to play next week's Irish Open, then the BMW PGA Championship at Wentworth and European Open in Kent. He has now broken 70 in his last four rounds and commented: "I don't know what other people were expecting of me coming back, but I just hope those close to me are happy. "I'm a little frustrated, though, because I haven't had any consistency with my putter yet."